With so many makes and models available it’s easy to feel overwhelmed when you at buying an automatic coffee machine for the first time. This detailed information on the three main classes of automatic espresso maker will help. The three main categories are semi-automatic, automatic or super-automatic and your selection breaks down to how much you want the automatic coffee machine to do for you and how much you have to do yourself. Different coffee lovers choose based on what is important to them. For instance, machines that have less automation allow you more control over your coffee, so you can make sure that it meets all of your qualifications. On the other hand, the more automated the machine, the less you have to worry about user error, and the less time it takes to get your coffee the way you want it. 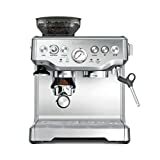 Once you decide on your budget and which category of automated espresso maker you’re most interested, your search for the perfect machine will be much easier. The semi-automatic machines offer the least automation of any automatic espresso machines out there. While much of the process still happens automatically, you choose when to turn the pump on and off. This means that you manually control how the water flows in every shot of espresso that you make. Otherwise, the pump and the activation switches that engage or disengage it, temperature controls, and the broiler are all automatic. It’s hard to tell which ones are the best, which are the worst and, most importantly, which one will give you that perfect, rich shot of espresso every single time. This is the middle class of espresso machine, when it comes to how much control you have. While the pump, water volumes, and broiler temperature controls are all automatic, there are usually still programmable features. You’re not controlling the pump physically for every shot, but you do get to choose the amount of water used. Super-automatic machines will do almost everything for you, though each one will have its own set of features and few will have every single feature. These are the latest and greatest when it comes to automatic espresso machines. You can find machines that will grind the coffee then automatically make the espresso. As well as machines that will add a predetermined amount of milk to the shots once they’re made. The purchase of an automatic coffee maker is a major investment for most people, both because of the cost of these machines and because coffee connoisseurs care a lot about how their coffee tastes. Then, you can investigate the different options for yourself and choose the one that best suits your needs, desires, budget, and available space. Before you even start educating yourself, though, there are some things you can consider. Some of these automatic machines are quite large, so you’ll want to determine where you’ll put your machine and how much space it can take up. After all, the last thing you want is to choose your favorite machine, only to find out when it arrives that it won’t fit in your home. You’ll also want to consider how much you want to spend on an automatic coffee machine. They can get very expensive, especially if you want one with a lot of bells and whistles. On the other hand, you may choose to pay more for a machine that is reliable and that produces great coffee every time. No matter which route you choose to go – semi-automatic, automatic, or super-automatic – you’re well on your way to making the espresso you love in the comfort of your own home. While the purchase of these automatic coffee machines is an investment, think of how much you’ll save in the long run when you can brew your own espresso.